US users are spending up to 5 hours a day on smart devices, with media and entertainment apps accounting for 15% of total time spent in apps.1 Whether it’s news, music, or video streaming, these apps have quickly become an essential part of our daily lives. In such a competitive market, how do successful media and entertainment apps keep their users attention and grow their audience? With the likes of Netflix and Amazon Prime Video venturing into new markets, SonyLIV has managed to hold its own by offering a wide range of content and running clever user engagement campaigns. With over 20 million app downloads and 9.5 million active subscribers, SonyLIV has some solid tips to take from their user engagement playbook. By convincing users to enable push notifications on first launch, SonyLIV is able to create highly contextual and relevant engagement campaigns based on viewing history, content preferences, and watchlists. SonyLIV mentions that their notifications include “alerts, sounds, and icon badges” so that users know exactly what they’re opting in to. The best way to encourage your users to enable push notifications is by explaining how they’ll benefit from them. Encourage users to allow location-sharing so that you can send updates on local shows, movies, live sporting events (based on their timezone), etc. Learn how CleverTap helps SonyLIV use real-time user analytics to send personalized push notifications that ramp up engagement and retention. 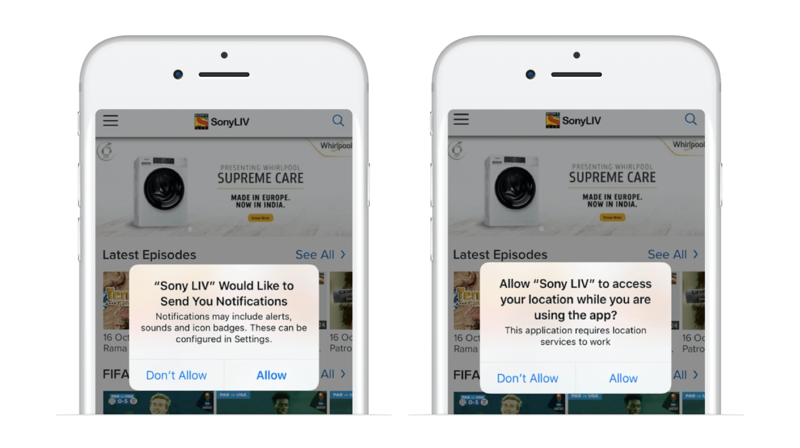 By pitching new video content that matches a user’s viewing history, SonyLIV encourages users to spend more time in the app. These related content notifications not only pique curiosity, they also provide a more customized user experience. This is a virtual form of content cross-selling. Non-intrusive in-app notifications encourage users to engage with new content, without disrupting the user experience. For instance, if a user is watching the highlights of an English Premier League soccer game, they might be prompted to view highlights for other matches from the same weekend. In addition, they might be prompted to sign up for an annual subscription plan to access the full season of games — all through in-app notifications. SonyLIV uses in-app notifications to request user ratings and reviews. 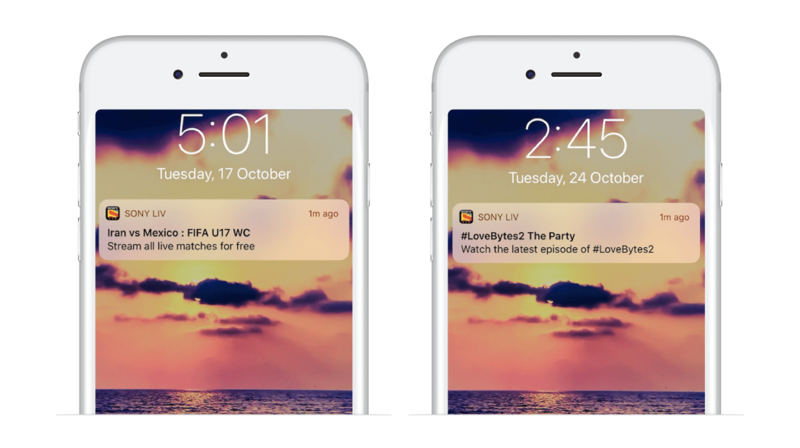 These in-app notifications are less intrusive and targeted only at repeat users, creating a reliable source of valuable user feedback that helps SonyLIV improve its platform and become more user-centric. Plus, favorable ratings and reviews boost the app’s ranking and visibility on app stores — which in turn increases the chances of new users downloading the app. When users install and use your media and entertainment app, they engage in different in-app activities that can be tracked and monitored as specific events at each stage of the app user lifecycle. Users who have successfully been onboarded, but haven’t completed a key in-app action like searching for a song or artist, reading an article, viewing a video, etc. Use in-app notifications to nudge an onboarded user to easily search for, create, and/or consume content upon first launch. Use in-app notifications to inform an onboarded user about the benefits of a subscription plan on first launch. Run personalized push notifications or email campaigns on days 1, 3, 7, 14, and 21 that inform onboarded users of fresh content, new features, social sharing options, etc. Users who have completed a key in-app action for the first time, such as commenting on an article, viewing a trailer, etc. Use in-app notifications or emails to suggest relevant content based on the user’s first in-app conversion event. For instance, if a user prefers horror movies, nudge them to watch “Suggested content” in the same or related genres. Run personalized push notifications or email campaigns to inform newly converted users of new content. Use in-app notifications to encourage newly converted users to sign up for a subscription plan for exclusive content. Run in-app notifications or email campaigns on days 7, 10, and 15 after the conversion event asking for ratings and reviews. Run personalized “We miss you” push notifications or email campaigns on days 3, 5, 10, 17, and 30 after the conversion event informing inactive users of new content. Users who have completed multiple in-app actions over a period of time, such as creating multiple playlists, savings articles to reading lists, etc. Run personalized push notifications or email campaigns encouraging repeat users to sign up for subscription plans. Run personalized push notifications or email campaigns to inform repeat users of new content. Run in-app notifications or email campaigns on days 7, 10, and 15 after the user’s last in-app conversion requesting app ratings and reviews. Run personalized push notifications or email campaigns on days 3, 5, 10, 17, and 30 after the user’s first conversion event informing him/her of new content available. Effective user engagement forms the foundation on which you can elevate content consumption and gradually convert irregular users into loyalists. For that to happen, you need to engage, engage, and re-engage in a personalized, contextual, and timely manner. I will discuss how you can amplify user re-engagement and retention for your media app in my next blog.